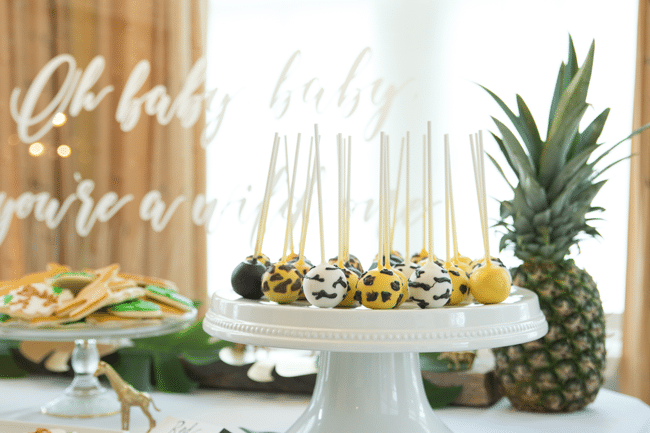 This Fun Jungle Theme Baby Shower takes celebrating baby to a new level! 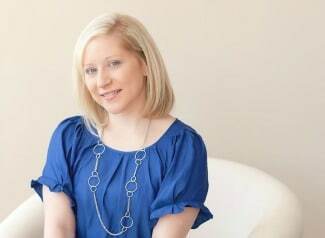 This soon-to-be mama knew exactly what she wanted for her baby boy! 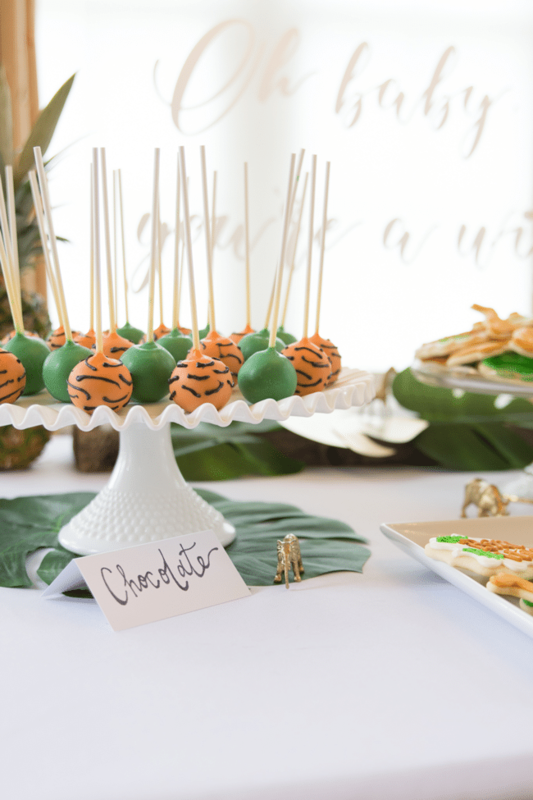 A glam and Fun Jungle Theme Baby Shower was quickly decided on, with amazing jungle theme baby shower decorations found all throughout the event. Guests went away with lots of smiles after showering this sweet couple with love for their upcoming bundle of joy! 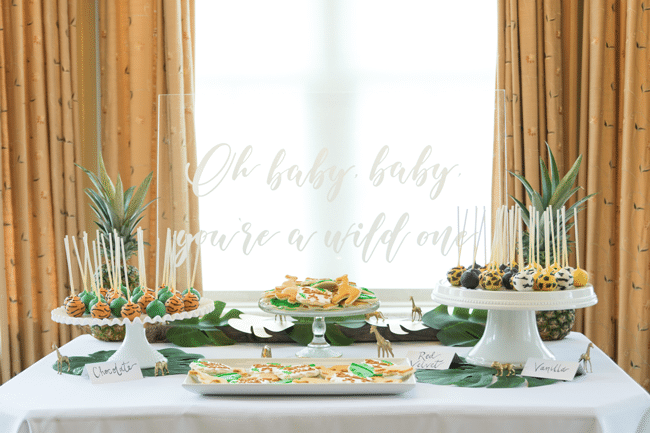 The Austin Mansion was the perfect backdrop for this unique Fun Jungle Theme Baby Shower! 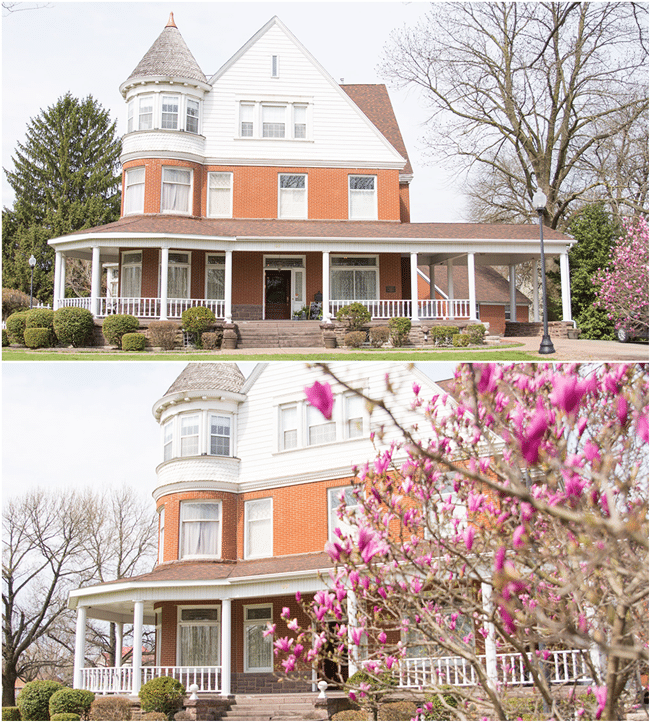 With spring in the air, the grounds were immaculate, along with the budding trees that were found along the property. What a perfect way to walk into a baby shower for a new life that was about to be born! Everything felt new and ready to bloom! 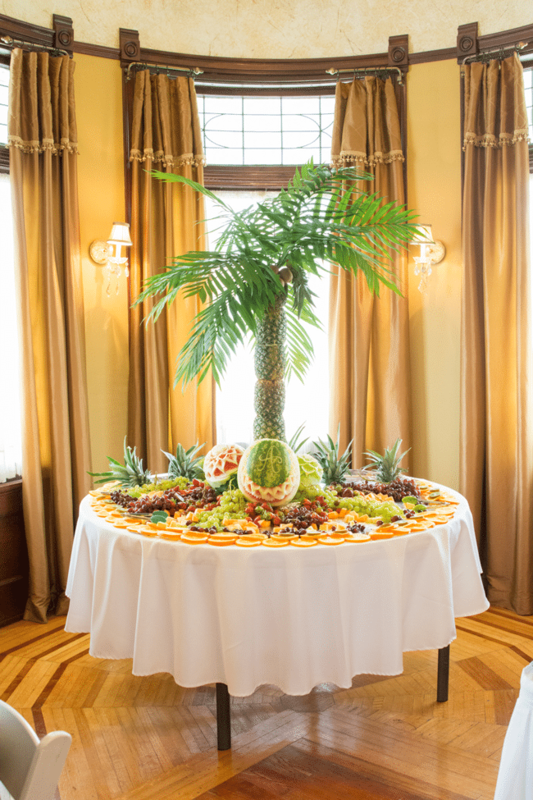 The clear show-stopper at the Fun Jungle Theme Baby Shower was the palm tree fruit table that was found when guests walked into the room. Can you even imagine how much time and effort this must have taken? A very loving family friend created this elegant display, complete with fruit carvings and “wild animals”. What an amazing display! 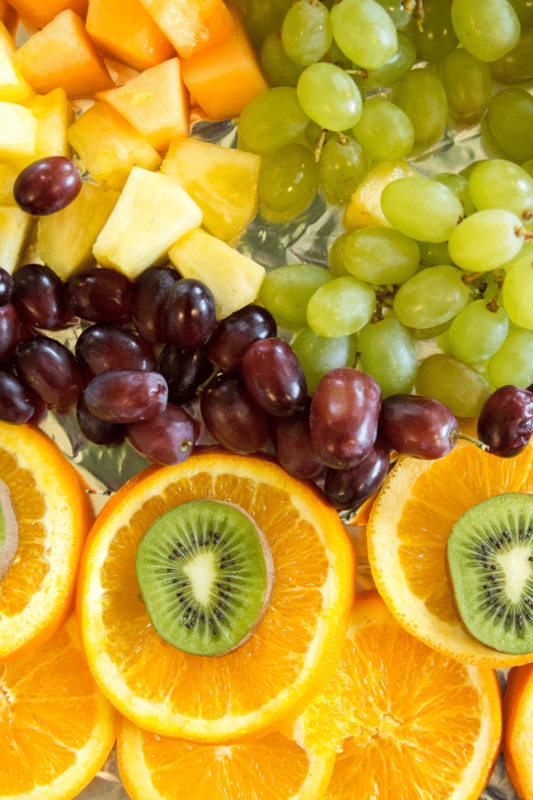 This wasn’t just any old ordinary fruit platter! Everything was so fresh and ready for all of the guests to dig into. It was a true delight and a great appetizer when the baby shower started. It can be difficult to come up with fresh baby shower ideas that people haven’t seen time and time again. But this amazing fruit creation was definitely unique! It absolutely amazes us how much time this must have taken to bring to fruition! 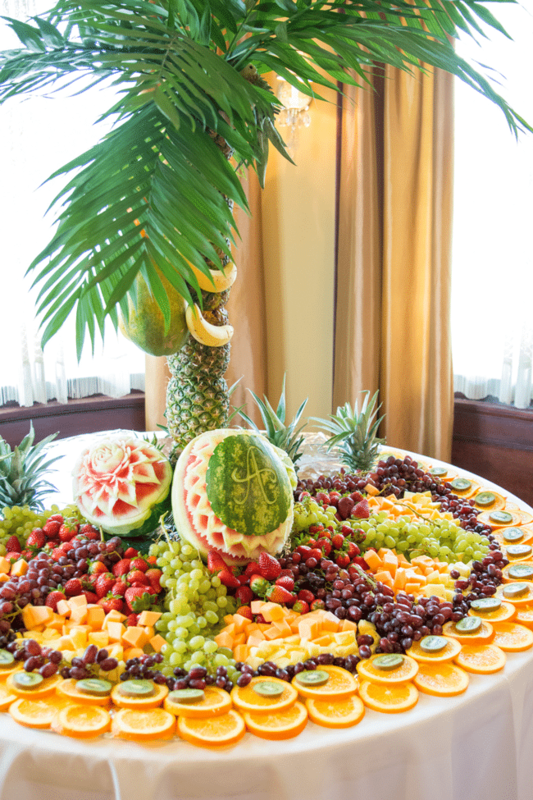 The custom palm tree made with fruit was almost too good to touch! Nobody wanted to ruin the exquisite craftsmanship, but it finally came time to dig into that delicious fruit. 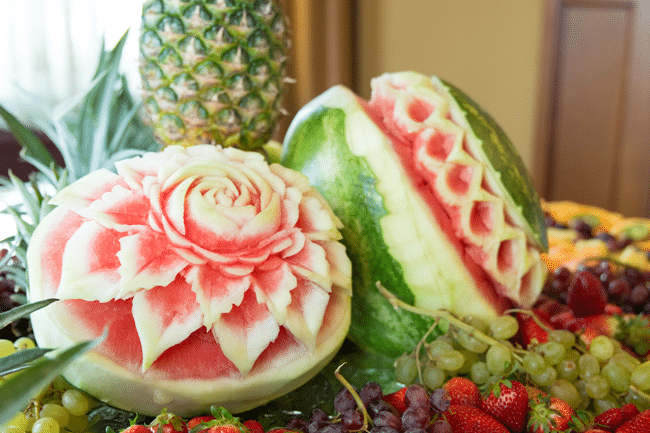 What a great fruit display for a baby shower. 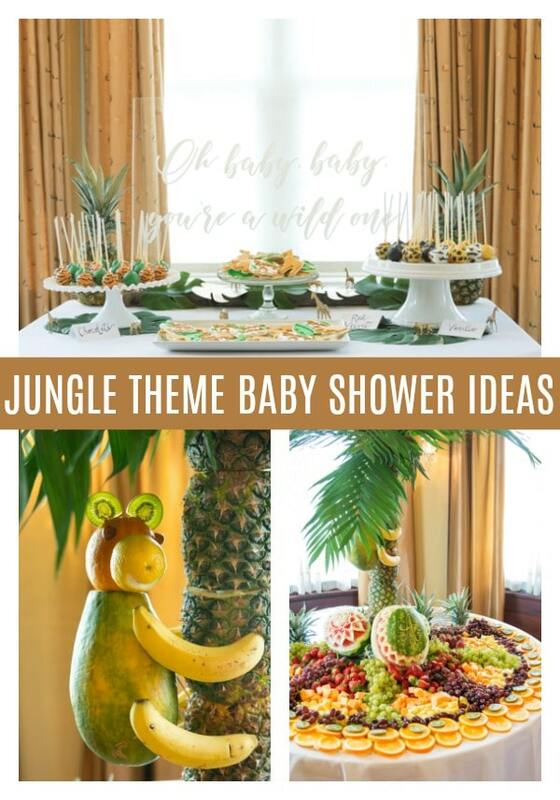 Especially for a jungle theme baby shower! 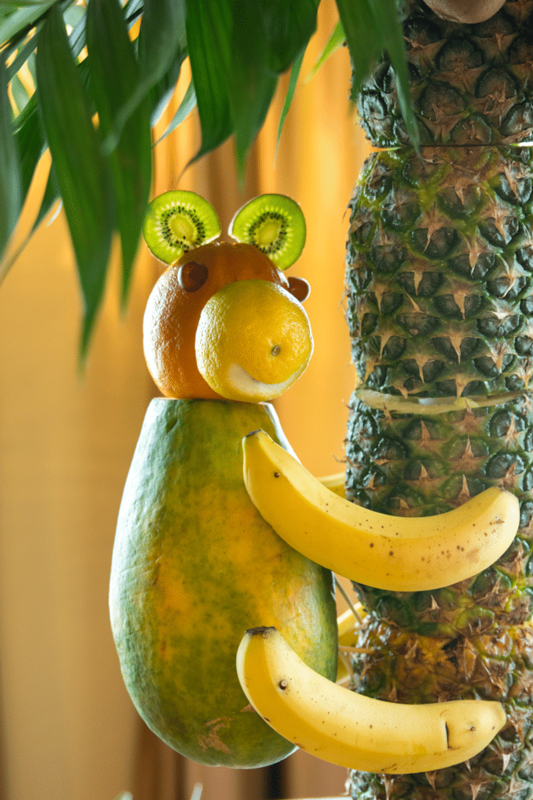 How adorable are the little jungle animals that were created from different fruit? We love how this little monkey was fashioned – placed to appear like he was climbing up the tree! So creative! Even “fruit birds” got in on the fun! Using pineapple leaves to create the “feathers” of a bird is a great idea! 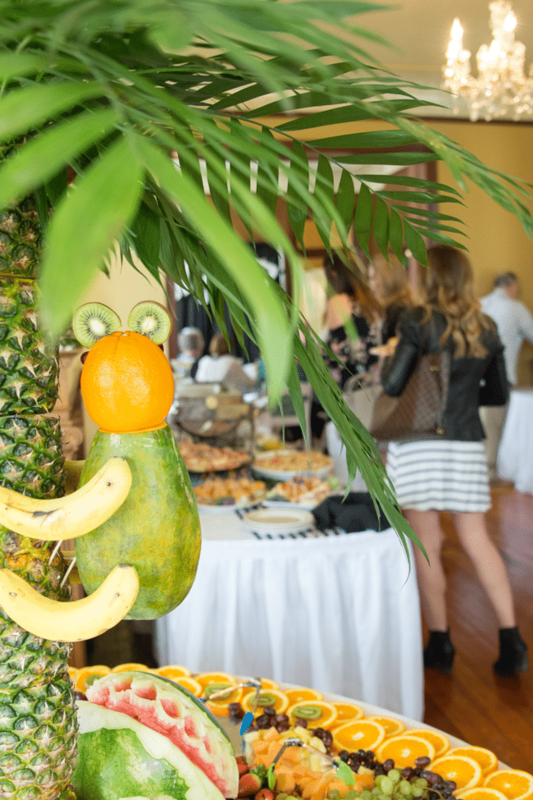 Looks like this little guy is happy being a part of this Fun Jungle Theme Baby Shower! 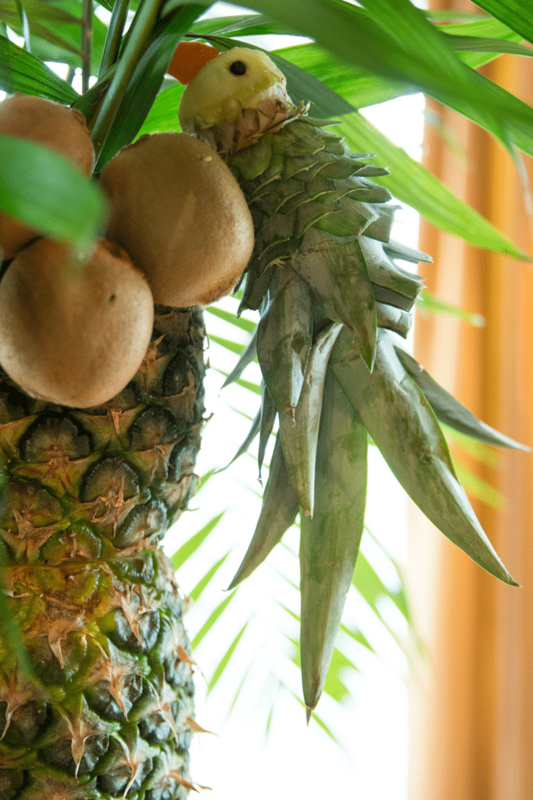 Guests found little “fruit animals” all over the place, peeking from behind the pineapple tree. They sure got many smiles throughout the day! Blushed Event + Design Co. did a fantastic job on incorporating the jungle theme. 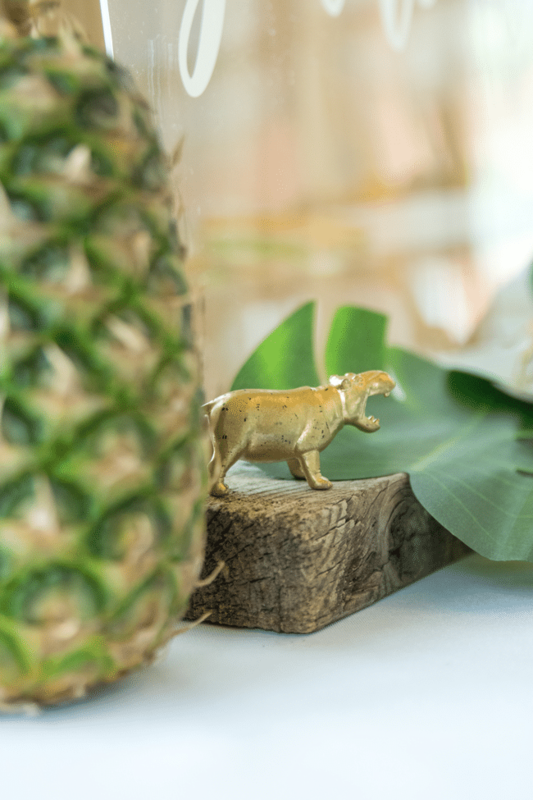 The gold jungle animal figurines were placed in different areas to serve as jungle theme baby shower decorations. One never knew where they might show up. Total cuteness overload! 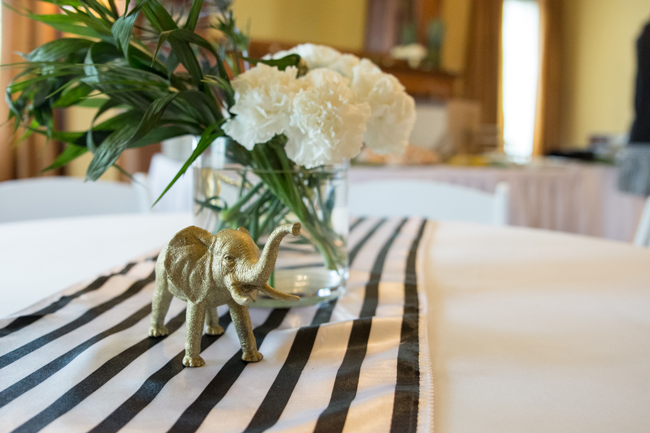 Elephants, along with other jungle animals, were found on the tables to create a jungle theme all around the baby shower. 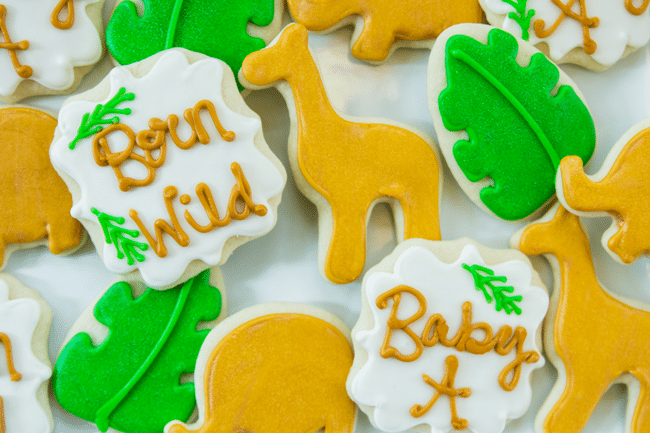 We just love this “WILD” sign that was found on a backdrop at the Fun Jungle Theme Baby Shower! Blume & Baum did a fantastic job with all of the florals and white hydrangeas that were placed around the jungle baby shower, too! Cookie Creations made the custom cookies that were gobbled up at the baby shower! Using the green and gold color scheme that was found throughout the event, they stayed true to the main style that was created from the beginning. 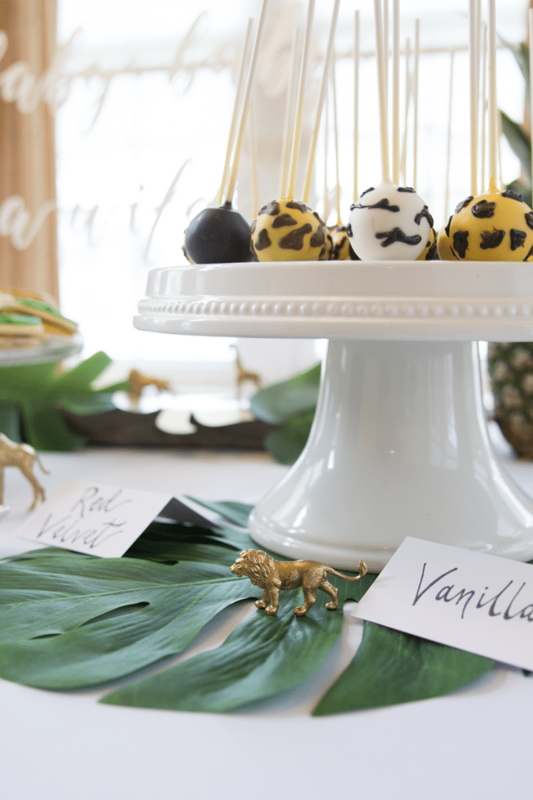 Delicious jungle themed cake pops were featured on the dessert bar, created by Jo’s Fatastic Cakes. 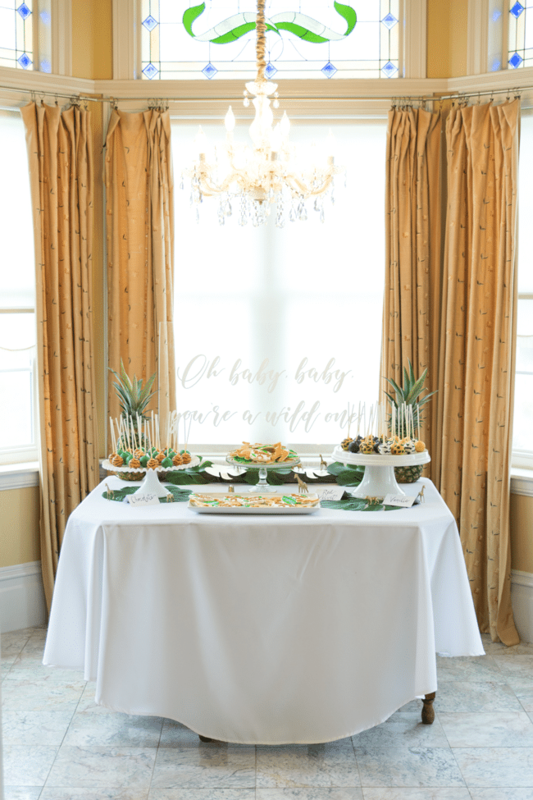 The green fronds that were found on the dessert table, along with the gold jungle animals, added that “jungle” touch to the entire setting. 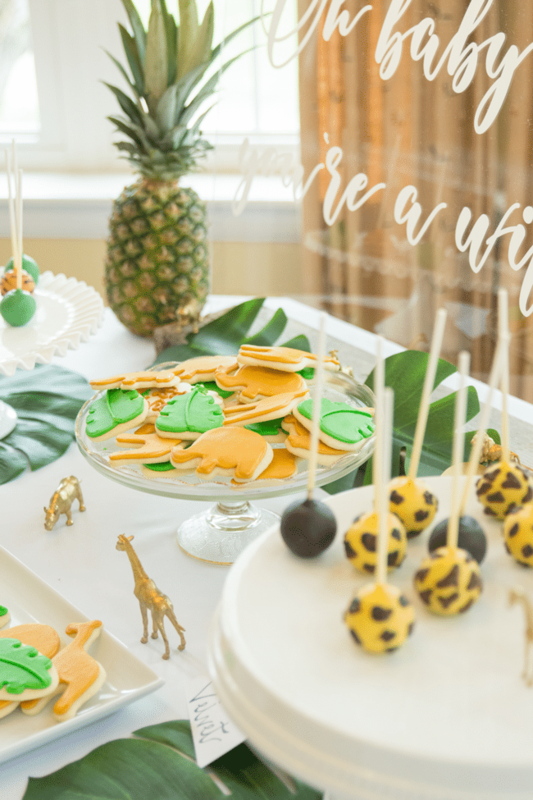 The clear sign that was used as a backdrop for the dessert table was a perfect addition to this Fun Jungle Theme Baby Shower. With the great font used, along with the white words shining through, it was elegant and easy to create! 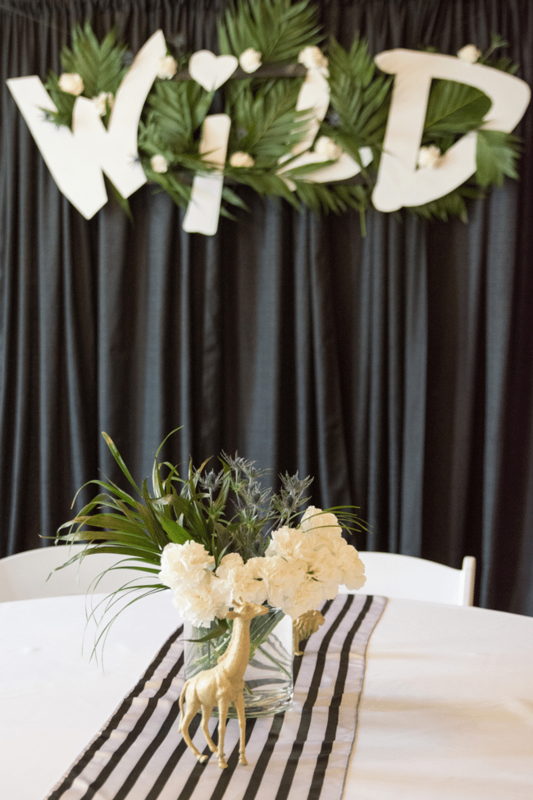 Green, gold, white and black inspired a majority of the color scheme for the Fun Jungle Theme Baby Shower. 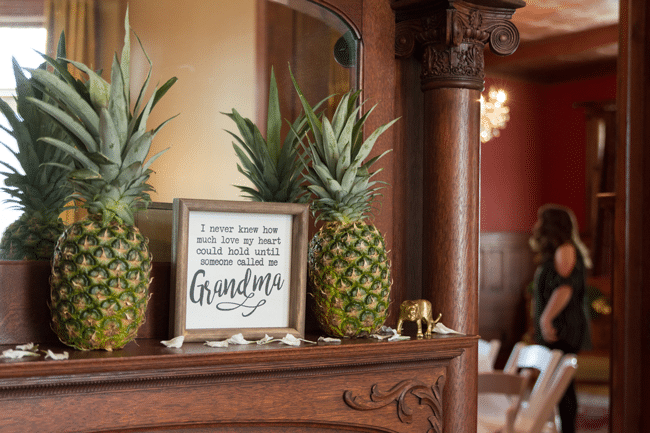 Pineapples also accented the dessert table, which looked festive and fun from the first sight! Gold jungle animals and pineapples accented the tables on top of black and white striped table runners. Everything looked gorgeous on this baby shower dessert table. 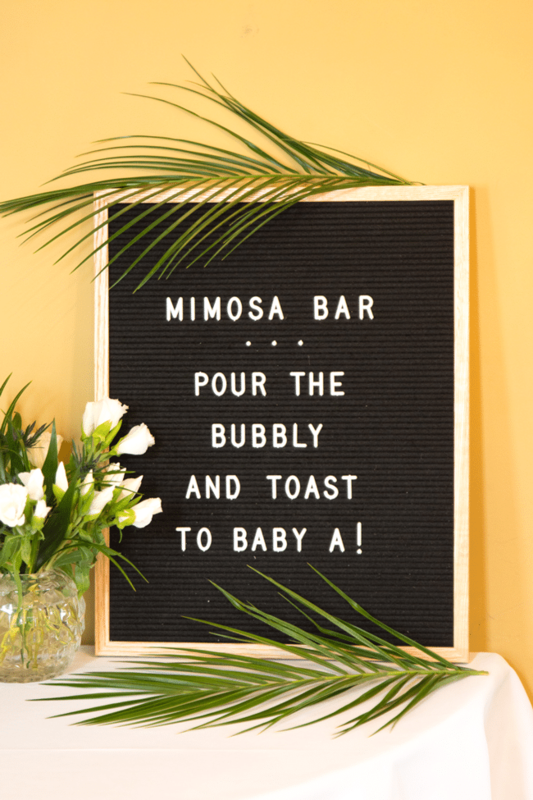 Guests were treated to a mimosa bar at the Fun Jungle Theme Baby Shower, where everyone was able to toast the new baby and parents! Elegant signage was found throughout the baby shower. Chalkboard signs have such a timeless look that can be created for just about any occasion. It especially looks amazing as one of the jungle baby shower decorations! 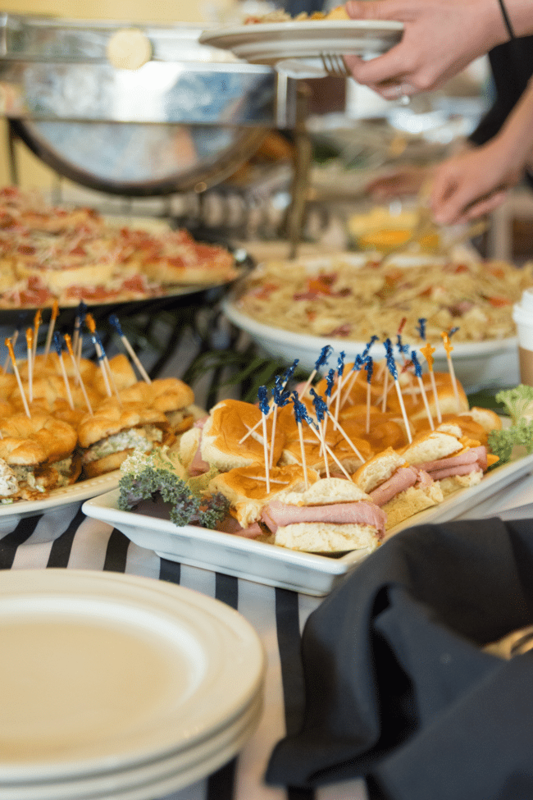 Catering from Thelma Keller Convention Center provided small sandwiches, fruit, bruschetta, quiche, and yogurt parfaits for the guests to enjoy. Everyone went home with a full belly and full heart! Green and gold play leaves, along with pineapples, adorned the mantles, chairs and tables. 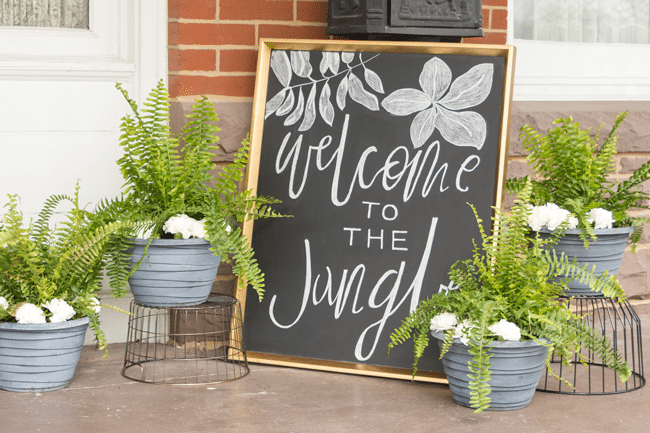 The jungle baby shower decorations were a hit and created the elegant, yet fun vibe that was desired. Any type of jungle event is always a fun way to spend a day, but this Fun Jungle Theme Baby Shower went above and beyond! What a lucky little guy! These parents-to-be are going to always remember this day, full of joy and love!